For the mobile game, see The Elder Scrolls Travels: Oblivion Mobile. 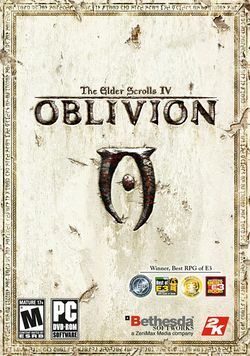 The Elder Scrolls IV: Oblivion is the fourth game in the Elder Scrolls series of RPGs. As with all versions, the player begins the game in Prison, going to Prison or having just been released from Prison. The player's primary task, in the very beginning of this game is to escape the Imperial Jail. Once freedom is attained then the player has several quest options, including following along the main storyline, to find an heir to the Empire and prevent the denizens of Oblivion from conquering Cyrodiil by way of Oblivion Gates. In the beginning the primary quest options were: Mage's Guild Quests, Fighter's Guild Quests and the Main Storyline Quest. Since the first release, other quests were released as downloadable content and now they're available as part of purchase of the Oblivion Game, Game of the Year version. (others may be listed, but have not encountered them during play yet). Obliv-o-Map, a fully interactive Flash version of the in-game map. Has all location markers but no quest markers as yet. Oblivion Mod Wiki a great little wiki that has far more oblivion mods then we could list. This page was last edited on 16 August 2016, at 17:49. This page has been accessed 74,816 times.